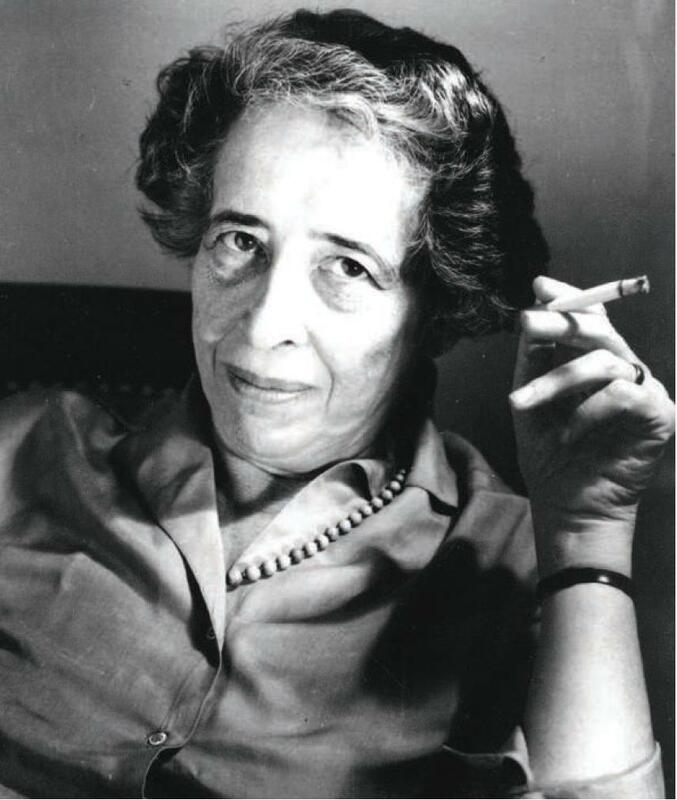 Hannah Arendt was a 20th century German-Jewish philosopher who managed to escape from the Nazis and immigrate to the United States, where she became famous for, among other things, her writing about the trial of Adolph Eichmann, the Nazi in charge of the concentration camps and one of the principle individuals who organized the Holocaust (the trial was held in Jerusalem, and remains the only exception to Israel's ban on the death penalty in the history of the Jewish state). Arendt's famous phrase for describing Eichmann, whose defense was that he was only following orders, is the banality of evil. It serves as a chilling reminder of the ease with which ordinary people can slip into a situation where they freely engage in acts of cruelty and violence, acts that they would otherwise condemn as immoral, and evil. Of course, there is much more to Hannah Arendt's life and work than this, and there is a center devoted to her thought located at the institution where she taught for many years (and where she bequeathed her papers), Bard College in nearby Annandale-on-the Hudson, New York. The Hannah Arendt Center there hosts their own blog, and I was honored to be asked to be a guest blogger for them last month. Last week I attended a public lecture at Fordham University given by Richard Bernstein, a philosopher on the faculty of the New School, the subject of the lecture being "Hannah Arendt on Power and Violence" and the sponsor being Fordham's Philosophy Department. The lecture began with some discussion of who Hannah Arendt was, e.g., German-Jewish intellectual, had an affair with Martin Heidegger when she was an 18-year-old student and he was a married professor in his 30s, wrote her dissertation on St. Augustine, escaped from Nazi Germany before things got really bad, met and became friends with Walter Benjamin in Paris, unlike Benjamin was able to escape to the United States, and famously wrote about totalitarianism, and the trial of Adolf Eichmann (architect of the Nazi concentration camps) and the banality of evil (which sums up my own previous encounter with Arendt's thought). Of course, that's just a cursory summary of a rich and eventful life. I joined a few of my colleagues from the Philosophy Department at Fordham and met with Bernstein prior to the lecture for some discussion, and he mentioned that, although Arendt was not a practicing Jew, at the end she asked that someone say Kaddish for her at her funeral. Admittedly, it's not all that unheard of for folks to suddenly get religion when the end is near (no atheists in foxholes, as the saying goes), and for individuals who have been disconnected from their traditions to suddenly want to reconnect. But what I found poignant about this request is that she asked for someone, rather than someone specific, which I take to be a sign of isolation in that typically it would be the immediate family who would say the prayer. No doubt, there were many who said Kaddish on her behalf, not the least on account of her significant work during and after World War II on behalf of Jewish victims of the Holocaust, and in general as a political philosopher with a strong sense of social justice. The remainder of my post is a discussion of Arendt's essay, Reflections on Violence, written for the New York Review of Books back in 1969, and which can be found online in case you'd like to read it. And if you'd like to read my commentary on her essay, Violence, Power, Technology, and Identity, you have the link to that as well. "What I propose, therefore, is very simple: it is nothing more than to think what we are doing." I couldn't resist sharing this news story here on our congregational blog, as it involves a cantor from one of our sister congregations, and the institution of higher learning where I work and teach, Fordham University. As you know, hazzan is the Hebrew word for cantor, traditionally the individual who helps to lead the Jewish prayer service. This requires proficiency in Hebrew, and also musical proficiency, as the Hebrew prayers are traditionally sung or chanted (the root meaning of cantor being chant). The role has evolved over the years, from amateur to professional, and from lay to clerical. I'll refer you to Wikipedia for its articles on the traditional role of the Hazzan, and the contemporary role as a member of the clergy of the Cantor in Reform Judaism . And as for hoops, that means basketball, but maybe you already knew that. If you’re hoping for a talisman to improve your team’s chances of victory, why not make it a man with a talis? That thought, at any rate, crossed the minds of officials at Fordham University, the Jesuit redoubt in the Bronx. Their men’s basketball team caught a hot hand during the Christmas break when a cantor named Daniel Pincus began singing “The Star-Spangled Banner” before home games. Normally, the national anthem is sung by the school’s choir, but the choir went on an out-of-state tour during the holiday recess. Mr. Pincus, 57, who is a cantor at Congregation Shaarei Shalom, a Reform synagogue in Riverdale, the Bronx, had already expressed an interest in performing the pregame ritual for Fordham. In case any you don't ever cross over the George Washington Bridge, and/or aren't all that familiar with the Big Apple, Riverdale is the section of the Bronx closest to Manhattan, just across the river from the island, and it's a lovely residential section. Like many New York area Jews, I had cousins who lived there back in the day, and they belonged to this Temple. On Dec. 22, before a game against Texas State University, Mr. Pincus made his debut at the Rose Hill campus in the Bronx, singing without his yarmulke and definitely without a talis (which is one way to render the Hebrew word for a Jewish prayer shawl). Fordham won. He sang a second time a week later against Georgia Tech. Fordham won again. A few days after that, in the first game of the new year, the visitor was nationally ranked Harvard. Fordham, whose nickname is the Rams, triumphed yet again. Suddenly, a team that had a losing record before Mr. Pincus showed up was on a roll. Could it be that the Jewish singer had become a good-luck charm for the Jesuit school? The cantor’s singing style was important to Mr. Diaz. “I just want to make sure that we have someone who sings it in a patriotic, proper way,” he said. His attitude reflects an element of superstition that is inherent to sports, perhaps more than to other phases of life. There’s the school of thought upheld by a character in the 1988 baseball movie “Bull Durham.” You have to “respect the streak,” he says. If you think you’re winning because you keep following the same pattern — like having a cantor sing the anthem — then you are. “We are superstitious, players and coaches,” Mr. Pecora agreed. The relationship between sports and superstition, well, that's well known, as Haberman notes. As for the relationship between religion and superstition, well that's one of the things that the Reform movement in Judaism traditionally addressed, as a product of the rationalism of the Enlightenment. And as for the relationship between religion and sports, my only comment is, oy! In basketball, it works only if you outplay the other guys. On Saturday, Fordham fell to earth. Despite having Mr. Pincus sing once more, the team’s home-court winning streak ended when it lost, 67-59, to Xavier University of Cincinnati. So it goes. But even though the Fordham choir is about to return from its travels, Mr. Pincus expects to be invited back for future games. “It seems now like I’m becoming part of the family, which is great,” he said. And why not? Among his talents, the cantor teaches the art of the shofar, the ram’s horn that is sounded on the Jewish High Holy Days. From the ram’s horn to the Rams is not too great a leap. And let me just note that there is no coincidence to the fact that Fordham chose a biblical animal as its mascot. And as for Jewish-Catholic and interfaith relations, well, this is a Bronx tale and a New York story, and we live in the New York Metropolitan Area after all. So, Go Rams! As we begin the secular new year, we might well reflect on our good fortune in being able to live our lives in relative comfort and safety, compared to what so many experienced not so very long ago. And we would do well to give thanks for those with the courage to remain righteous in dark times, and let their actions serve as an example to guide and inspire us as we face whatever shadows we may encounter in our own time. My cousin in Israel shared the following music video with me, which I found very moving in the story it relates (sung in Hebrew, with English subtitles), and in the stunning vocals of Keren Hadar. According to the write up on YouTube, the song, written by Dalia and Shaul Harel, Dan Almagor, and Rafi Kadishzon, was "written in honor of Andree Geulen on the occasion of her 90th birthday. In Belgium, during the Holocaust, she undertook the rescue of many Jewish children." This song, composed very shortly before the event, arose from an impulse on the part of one of the hidden children — Shaul Harel, who today is a professor of pediatric neurology. One warm summer day at the Isrotel Dead Sea Hotel, the Harel family was visiting for a performance of the opera Aïda at Massada. Shaul Harel was lolling alone in the whirlpool bath. As the warm water and the complete solitude began to take effect, he wondered intensely what gift he could bring to Andrée for her birthday. "After all, she already has everything. After the war, she married a Jewish attorney, they were blessed with two daughters and with grandchildren and great-grandchildren, and to this day she is surrounded by the love of the children she rescued." Suddenly, as to Archimedes in his warm bath, the Muse descended to him. Although he did not emerge with a mathematical equation — since mathematics was never his subject — he just as suddenly decided to write her a poem. And this is not to be taken lightly, since for many years he had written nothing but medical documentation and articles. The warmth of the water and the atmosphere brought lines tumbling into his mind, and as if possessed, he burst into the hotel room and told his wife Dalia to sit down and transcribe because otherwise the lines would "get away" from him. His wife raised her eyebrows, thinking that the desert heat had overpowered him. But she consented and soon a poem was on paper telling Andrée's story. Shaul's imagination took him further and he said that the poem should be set to music and his favorite singer, Keren Hadar, should perform it. Since the poem was written in free verse, Dahlia worked rhymes into it. The poem was read to Keren and she was moved to tears. She said that it was suitable for setting to music and that she would like to sing it. She recommended Rafi Kadishzon, a prolific and well-known composer. Rafi heard the poem, liked it, and immediately recommended Dan Almagor, a master of the Hebrew word, to adjust the text for the music. In the end, Dan Almagor contributed greatly to the rhythm, to the refrain, and to the perfect fit of the lyrics. All this occurred in the course of two weeks. A week later, the song was recorded, the DVD visuals were prepared, and copies were printed with graphics and with a French and English translation. Everyone who saw it was moved, and now here it is for you. And for the inspiration, poetry, inspired musical composition, and generosity in sharing these beautiful sounds, images, and story, we can also be grateful.